Modern instruments help to check whether manufactured equipment meets the proliferating variety of international safety standards that govern factors such as grounding and the ability to withstand overvoltages. Electrical safety testers — often referred to as hipot testers — are an integral part of electrical and electronic equipment manufacturing. Hipot testers get thei name from the high-potential (high voltage) they produce to perform dielectric withstand and insulation resistance tests. In addition to these tests, many hipot testers provide accurate low-resistance measurements and low-resistance/high current outputs to test ground resistance and ground bond integrity. Electrical safety testing and certification is a requirement for virtually every electronic device and electrical apparatus. The details of what defines a certified product depend upon a daunting number (hundreds) of safety standards and in what region of the world the device will be sold and used. (Safety standards-setting organizations include: EN/IEC (European), UL (US), CSA (Canada), CCC (China) and JEIDA/MITI (Japan). During dielectric-withstand tests, hipot is applied to both conductors and leakage is measured in return circuit through the ground connection. Work is progressing to harmonize standards from global agencies. For example, IEC 61800-5-1 is a safety standard specified by the International Electrotechnical Commission for adjustable speed electrical power drive systems. It covers the safety aspects related to electrical, thermal and energy. The former UL standard (UL508C) has now been supplanted by a new standard, harmonized with the IEC requirements. To further help manufacturers address this often bewildering array of international (and sometimes conflicting) standards, the Power Sources Manufacturers Association (PSMA) has established a standing committee and forum on its website. Electrical safety testing is an important final step in the production process for most electrical and electronic equipment. It aims to assure compliance safety agency labeling requirements, detect defective components or assembly flaws, and reduce the incidence of latent field failures and the attendant warranty costs. Once in production, products must be 100% tested to confirm compliance with the related agency certifications and safety standards. Production tests are less stringent than initial certification but will generally include basic dielectric-withstand and shock hazard (leakage) tests. Plug-connected devices will also be subjected to ground-resistance and (if the standard requires) ground-bond tests. Electrical motors, transformers, and other such devices will likely include insulation resistance testing. Periodic inspection and calibration of test equipment is a standard requirement to maintain NRTL certification. Agency inspection will include a check of the hipot instrument calibration certification. This “cal cert” is typically required annually. (UL and other NRTLs require compliance certification with ISO17025.) another common requirement prescribed by most NRTLs is a daily functional test of the hipot equipment. 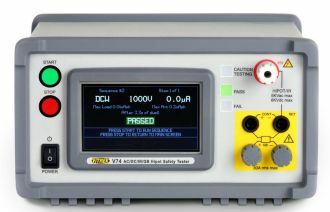 The Vitrek V7x Hipot Tester is well suited to the requirements of electrical safety production testing. confirm that there’s sufficient insulation and isolation of the non-conducting surfaces from the operating voltage to avoid a shock hazard. The typical specification for this test is: 1,000 V + 2x normal operating voltage. 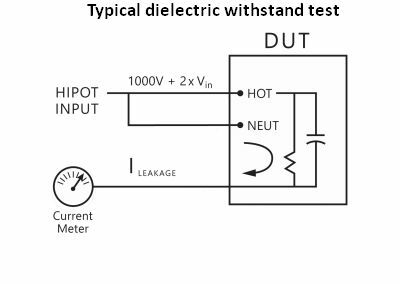 Both ac and dc hipot tests are possible and, in general, the test should use the same type of voltage as would be present during normal operation. However, if a dc hipot test is used on an ac circuit, the hipot voltage should be two times the peak (2 x 1.4 x RMS) + 1,000 V.
Depending on the application standard, units pass this test if either the leakage current measured is less than the maximum allowable current, or no breakdown occurs, i.e., no sudden and uncontrolled flow of current. For double-insulated products, test standards will often specify higher voltages. In addition, this class of device typically requires special fixturing to connect the non-conductive outer shell to a conductive element. Several features may come in handy on instrumentation designed to run dielectric-withstand tests. The maximum output voltage is adjustable — a 5 kV maximum is adequate for many applications, but higher voltages (up to 30 kV) may occasionally be necessary. Both ac and dc outputs are advisable, with excellent regulation on both the line and load. Ramp rates, dwell times and discharge features should all be controllable, and the instrumentation should be capable of measuring the phase angle of leakage current via capacitive coupling detection. Some standards allow for in-phase and quadrature current to be measured separately. Leakage current due to capacitive coupling may not be a safety concern. Instrumentation also should include a way to specify current limits for min/max pass/fail, as well as separate limits during ramps, and programmable multichannel testing. Insulation resistance testing is likely to be required for motor windings, transformer windings and other applications involving cabling or insulated wire. Insulation resistance testing typically involves confirming that the resistance exceeds a defined high resistance value. 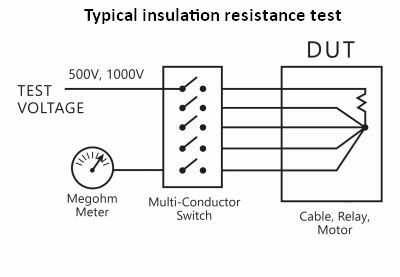 During insulation resistance tests, voltage is applied to one conductor at a time while adjacent conductors are bundled. Resistance is calculated based on leakage current. measurement, all conductors except one are shorted together and the test voltage is applied from the remaining conductor across the shorted bundle. The test is then repeated for each wire in the bundle. Instrumentation for insulation resistance tests have several features that simplify the measurement process. Among them are the inclusion of a wide range of selectable test voltages, an ability to run accurate and repeatable high-resistance measurements, a programmable high-voltage switching accessory and a multichannel programmable testing facility. Ground continuity testing confirms that the conductive chassis of a device safely connects to the earth-ground pin on the power plug. This connection assures protection against shock hazards even if the equipment suffers an internal short to the chassis. The current would be shunted via the ground wire and would likely trip the breaker or blow the fuse. Checks of ground continuity apply a low current (e.g. 50 mA) and calculate the resistance from the ground pin on the power plug to selected locations on the exposed surfaces of the DUT. Desirable features of ground continuity instrumentation include an accurate, repeatable low-resistance meter, and a plug adapter accessory to speed testing. The Vitrek TL-UP1 Test Adapter accepts widely used North American, European and Asian style power cords. The Vitrek TL-UP1 accessory visible here is an example of an accessory device that simplifies ground continuity test setup. With its four-foot leads, the accessory offers easy hipot and continuity test connections of corded products. Where ground continuity measures the resistance of the safety ground connection, the ground-bond test assures the integrity of the connection. Using the same test setup, a high current is passed through the circuit. If the ground bond is solid, the current passes without a change in resistance. A week ground bond will cause resistive heating that would induce a failure of the bond. 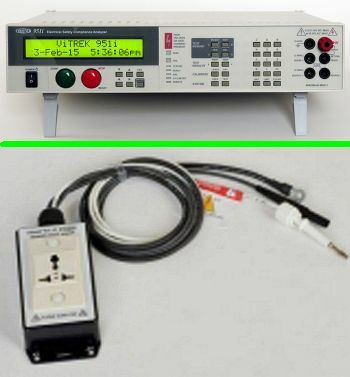 Instrumentation for ground bond tests generally should include an accurate high current source, a means of programming test currents and test times, a plug adapter accessory to speed testing, and a four-wire milliohm meter — one providing a Kelvin connection for highly accurate low resistance measurements. Electrical safety testing is a universal requirement for electrical and electronic equipment. Testing to specific regional requirements can be a daunting task, but programmable features and functions of advanced hipot testers can help simplify the task. NRTLs in every region of the world provide services to certify compliance with applicable standards. They will also regularly inspect the equipment and testing facilities used to perform production testing.